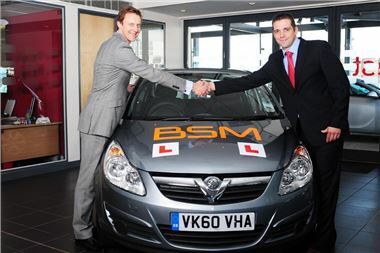 BSM (British School of Motoring), the UK’s most popular driving school, is delighted to announce a major new partnership with Vauxhall. In a deal that sees the companies rekindle a previous 18-year relationship, Vauxhall will become the new fleet provider for BSM from March 2011. The Spanish built Vauxhall Corsa will begin replacing the Polish built Fiat 500 (BSM’s current fleet cars) from 2011, with the exchange completed by the end of the same year. Vauxhall will provide BSM’s 3,250 strong fleet with 1.2 ecoFLEX and 1.4 litre 5-door Corsas over several years. BSM is confident that the new fleet will give its learners and instructors a superior driving experience. The company have worked closely with its instructors to identify what would make the ultimate driving instructor’s car, and requested that a number of modifications specific to the needs of learner drivers and instructors be made. Those modifications include larger dials on the dashboard for improved instructor/ learner visibility, rear headrests and upgraded power steering. Also, in recognition that instructors often use their cars not only as a tool for their trade but also as their primary family vehicle, BSM has moved to a 5-door model. BSM haven’t compromised on the great safety and green credentials they enjoyed with the Fiat 500 either; the Vauxhall Corsa enjoys a 5 star NCAP safety rating as well as excellent fuel consumption. The new deal will make the Corsa even more visible on the UK’s roads and as the subject of the deal between BSM and Vauxhall, will underline BSM’s position as market leader. BSM is celebrating its 100th year in business since it began trading in 1910 and currently teaches more than 130,000 learners a year and employs over 3,500 instructors, making it Britain’s biggest driving school. BSM currently serves high-profile contracts including Motability for disabled learners and has partnered with the Ministry of Defence in an initiative to teach Army Infantrymen to drive before they enter into active service. BSM is the UK’s leading driving school, with over 3,500 driving instructors teaching more than 130,000 learners to drive each year. BSM is one of the most recognised British brands with over 100 years of history. BSM is also one of the largest providers of instructor training and carry out driver training for companies as well as the public and governmental sectors. BSM has been teaching people to drive since 1910 and is fully committed to helping people become better safer drivers, not just training them to pass their test. The company taught the Queen to drive and helped design and implement the modern driving test.